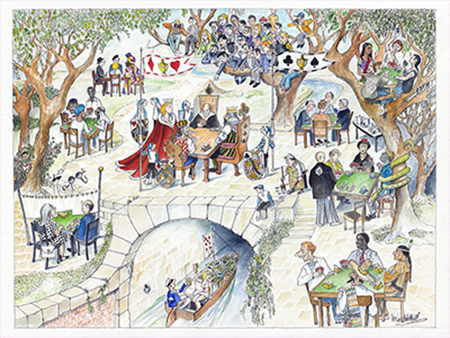 Check out the lastest bridge events, current bridge games and seminars newsletter for information! We will have a Silent Auction again this year, but plan to limit it to travel, bridge items, including lessons and expert play, and gift cards. There will also be some door prizes throughout the day. We hope you can join us on our upcoming bridge cruise and/or bridge trip! SHIPBOARD CREDIT: $400.00 USD per cabin if booked by March 10, 2019. $200.00 USD shipboard credit if booked after March 10, 2019. 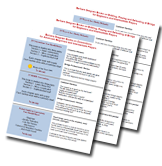 Interested in learning about bridge? 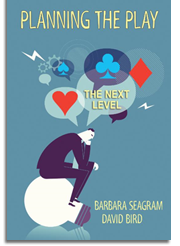 Barbara Seagram (Toronto, Canada) ran one of the largest and most successful bridge clubs and bridge schools in N. America for many years, the Kate Buckman Bridge Studio. After selling the club in 2006, she now concentrates solely on teaching and organizing her popular bridge cruises, in addition to building and sustaining schools in Cambodia (thanks to the support of so many in the bridge community and her partner in this venture, Pati Lee). 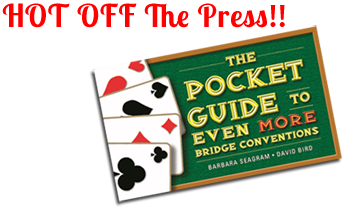 An ABTA Master Teacher, Barbara has co-authored many successful titles, most notably 25 Bridge Conventions You Should Know. With more than 300,000 copies in print in English alone, this book is the bestselling bridge title of the last 50 years. It has been translated into Japanese, French, Danish and German. 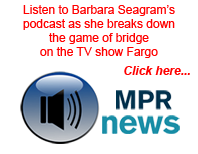 Listen to a brief interview with Tracy Mumford about the TV show “Fargo,” with a 10 minute interview (at the end) with Barbara talking about the game of bridge. Paola is an excellent agent with years of experience. and she can help you with ANY trip you wish to go on. You asked for it again! 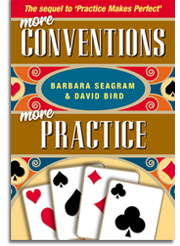 Following the runaway success of Practice Makes Perfect, bridge teachers asked the authors to produce a similar companion book to 25 More Bridge Conventions You Should Know. And here it is -- a brief summary of each of those 25 MOREconventions at the start of each chapter, followed then by example hands that can be dealt out and used to apply your new knowledge. Such conventions as: Cappelletti, DONT, Inverted Minors, Redoubles, Four Suit Transfers, Forcing No Trump, Control Bidding, Exclsion Blackwood, Bergen Raises, Gambling 3NT, Support Doubles, Puppet Stayman, Flannery, Unusual versus Unusual. Contact Barbara via email: to get your copy!!! You may pick up the books from us at a convenient address in North Toronto if you pre-arrange by email. We leave orders between our doors. 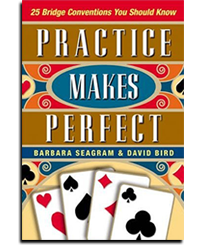 Barbara's first book in this series (also co-authored by David Bird) won Book of the Year Award by the American Bridge Teachers' Association: Planning the Play of a Bridge Hand. 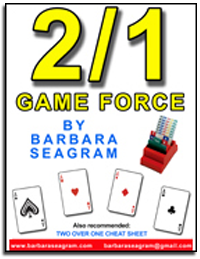 That first book introduced the basic concepts of how to go about making a plan as declarer for beginning and improving players, and is a popular text for bridge teachers. This sequel extends the plan to more complex situations, and covers ideas such as safety plays, avoidance play, trump control, dummy reversal, and endplays. It will appeal to players who have a good grasp of the basics of declarer play, and are looking to improve from there. Lee or Wayne at their excellent Tuesday and Wednesday afternoon and evening games at Temple Sinai Synagogue @ 210 Wilson Ave.
You may pick up the books from us at a convenient address in North Toronto if you pre-arrange by email. We leave orders between our doors. Buy Book # 1 and 2 for $40.00. Over the years, readers have suggested that it would be an even better book if it offered some way to practice what they had learned. Now, here it is: Barbara's 25th book...a brief summary of each of those 25 conventions, together with example hands that can be dealt out and used to apply your new or brushed up knowledge. It can be mailed to you or you can pick it up in Toronto. 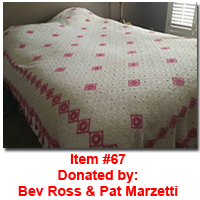 Available by emailing Barbara at , or at Temple Sinai 210 Wilson Ave or at 2737 Bayview Ave on selected days only. It can be mailed to you or you can pick it up in Toronto! Simply explains all you need to know about this system that has swept the world. Quizzes within will make you very comfortable with the system very quickly. And if you don’t play it, at the very least you should understand what your opponents are playing. MY TWO OVER ONE CHEAT SHEET IS NOW OUT! If you don't have Barbara's other cheat sheets, we will be happy to send these out to you. Just send us your postal mailing address and we will send. When you receive the package, have a look to see cost of postage on outside of packet. Send us a cheque for cost of the product and add the postage. Sorry but we do not take credit cards. Special Valid until April 30th! A summary of all the fancier conventions. A VERY useful summary in a nutshell. You will love it. Which book will help YOU the most? 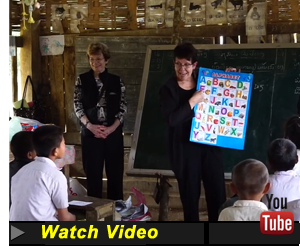 Barbara was in Cambodia February 14-24! From March 1 - March 18, Barbara is on a river boat in Myanmar! Read all about BARBARA's ASIA & AFRICA JOURNEY on her blog!!! to help her fellow mankind. 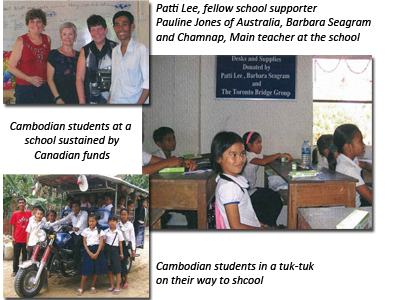 About three years ago, Seagram and fellow tour guide Patti Lee discovered a need in Cambodia and went into action. Today, they and their supporters sustain the operations of four schools in Phnom Penh area, paying for electricity, supplies (including computers) and the salaries of teachers and librarians. The ACBL is renewing the public education campaign initiated by Seagram, Cronin and Jacobs more than 15 years ago. 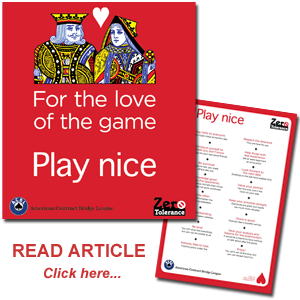 The theme, "Play nice," transposes two words we all like to hear at the table ("nice play!"). 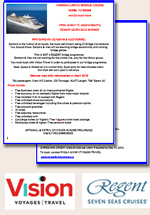 New posters have been developed and are being disseminated to all clubs. "I think that all players are responsible for policing this situation. When I call a director about a problem (perhaps at an adjacent table), I make a point of checking with the director later to see what penalty was awarded. If none was, the director gets to listen to me expound on the subject, and if that doesn't work, I then a) report the situation to ACBL and b) speak to the offender myself." Just south of 401, east side of Bayview. Entrance to the parking lot is via a driveway on the north side of Truman Road, immediately East of the church building. 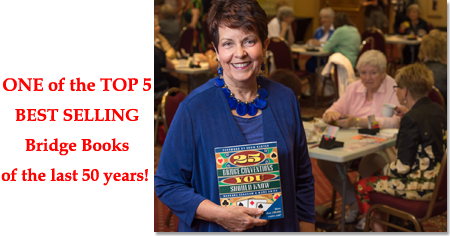 Maureen Hall, is Founder and Manager of the Beginner Intermediate Lounge (BIL) - A pleasant and friendly place to enjoy learning and playing this wonderful game! As a B.I.L. Player, you will have the opportunity to learn from some of the best of the world's bridge experts, play in exciting tournaments, have easy-to-read instructions for using BBO software, and, perhaps more importantly, share the love of bridge with friends around the world.